The 'People' tab lists other people's client and email certificates. You usually obtain these by receiving a signed email from the person in question. These certificates are necessary if you want to encrypt messages/email you send to the contact. Likewise, they will need your certificate to encrypt messages they send to you. To view the certificate, select the certificate and click 'View'. The general information and detailed information on the certificate will be shown under respective tabs in 'Certificate Viewer' dialog similar to that of your certificate. Please see View the Details of the 'Certificate' in the previous section. In addition to other people's certificate's certificates automatically stored in your browser, you can manually import some people's certificates with whom you may communicate through encrypted channel. For example, you can export your contact's certificate to your local storage and import into IceDragon browser. The procedure is same as importing your own certificate. Please see Import your certificate in the previous section. 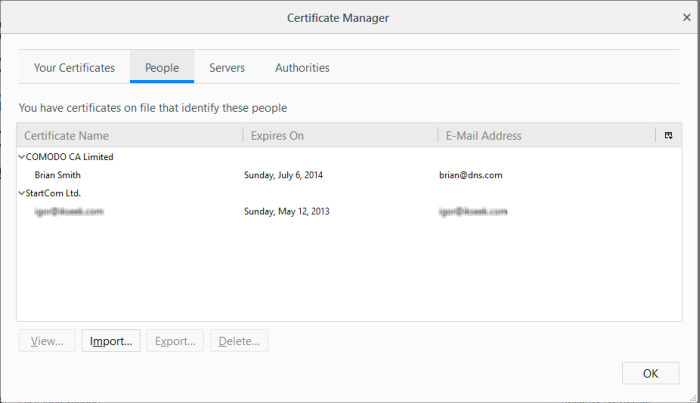 You can export other people's certificate from IceDragon to a safe place, for safe keeping and for importing from other browsers or email clients. 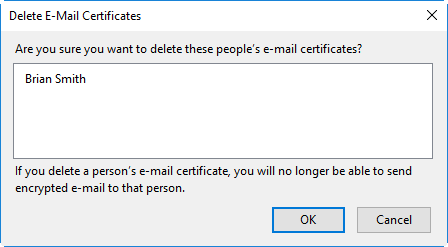 Select the certificate to be deleted and click 'Delete'. Click 'OK' in the confirmation dialog.